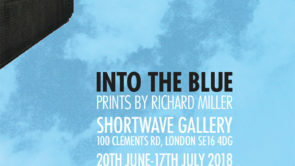 In examining the next chapter of Tanner Street’s history, we must first consider the life of Richard Russell. In the late 18th century, Five Foot Lane was renamed Russell Street after Richard Russell, who was a Justice of the Peace for the county of Surrey. Russell was certainly a larger than life character. A Woolstapler by trade, he collected art and was a member of the Royal Society. Richard Russell had inherited a sum of around £10,000, a fortune by modern standards, left first to his mother by his father John, who had built up a successful business as a Fellmonger. He often put his fortune to good use, rewarding his servants with handsome salaries and supporting the parish charity school. You can find his name recorded on the stairway in the north west corner of St Mary Magdalen in Bermondsey Street. His interest in the arts extended to sculpture and he left a large sum of money for a monument to himself in St John’s, Horselydown, where he elected to be buried as St Mary Magdalen did not have the room for memorial of such a large size. He had a kind of a cynical turn, which led him frequently to oppose the sentiments of others; and that rendered him in a degree unpopular. Those who knew him best were not disgusted with his character, which, though odd, blunt, and singular, was sometimes thought entertaining and always honest. After willing various large sums of money to different charities, he desired that £500 be spent on his funeral, exclusive of £50 each to six young women who were to be pallbearers, and £20 each to four other young women who were to strew flowers before the corpse. 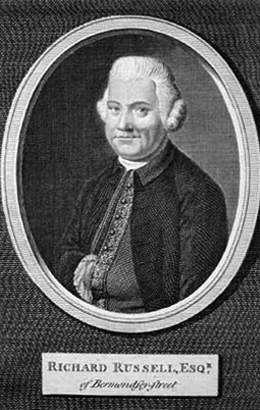 He was buried at St. John’s, Horsleydown, a sermon being preached by the rector, Mr. Penneck, which Mr. Russell expressly desired might be a short one, and which the tumult prevented being heard. In 1740 church commissioners bought out the remaining 10 years of an existing lease for land and buildings used to benefit the poor and originally owned by Owen Clunn in the 16th century. 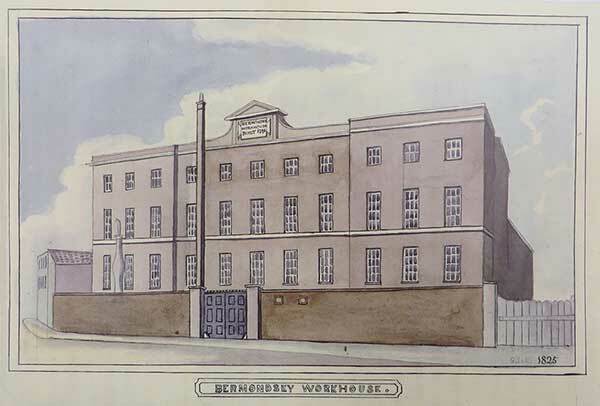 In 1746, the parish ordered that a workhouse be built for 250 people on the same site. It appears to us that as these premises were given for specific charitable uses, clearly defined by the donor, the parish are not justified in appropriating them to another purpose. We think that the parish should pay a reasonable rent for the work-house, which is estimated at about 20/. a year, of which 21.12s should be added to the weekly gift of bread and the remainder should be applied in a distribution of coals as directed by the donor. The Workhouse was extended over the years and it’s presence certainly dominated Russell Street. The census of 1881 tells us that William White Parkinson was Workhouse Master at this time, helped by a staff of 16 of which 7 were nurses. There were 267 residents of which 115 were labourers, 8 Tanners and 5 Leather dressers. Occupations of other residents included Farrier, Twine Spinner, Seaman, Sailor, Mariner, Shoemaker, Currier, Blacksmith, Joiner, Shipwright, Painter, Skinner, Deal Porter, Barge Builder, Lighterman, Paper Maker, Slater, Hop Sampler, Wire Weaver, Commercial Traveller, Cooper, Cordwainer, Rigger, Sawyer, Pork Butcher, Hawker, Draper, Printer, Clerk, Mason, Scavenger, Coal Porter, Shepherd, Rope Maker, Brick Layer, Furnaceman, Carpenter, Engine Fitter, Warehouseman, Cook, Tailor, Chimney Sweep, Green Grocer, Hoop Bender, Sadler, Compositor, Last Maker, Leather Presser. The whole site is below high-water mark, and formerly was part of the bed of the Thames. The consequence of this is that the house is often flooded, the water standing two feet deep in the basement! Of course it was these same tidal streams of the Thames which made Bermondsey a perfect location for tanneries, which used the waters to cleanse skins in the tanning process. The peculiar conditions of the parish render it inevitable that this class of paupers should exist in great numbers, the fluctuations of commercial and manufacturing operations frequently throwing many working people at once out of employment; and as these poor folk are not distinguished by provident habits, their application for casual relief follows as a necessary consequence. 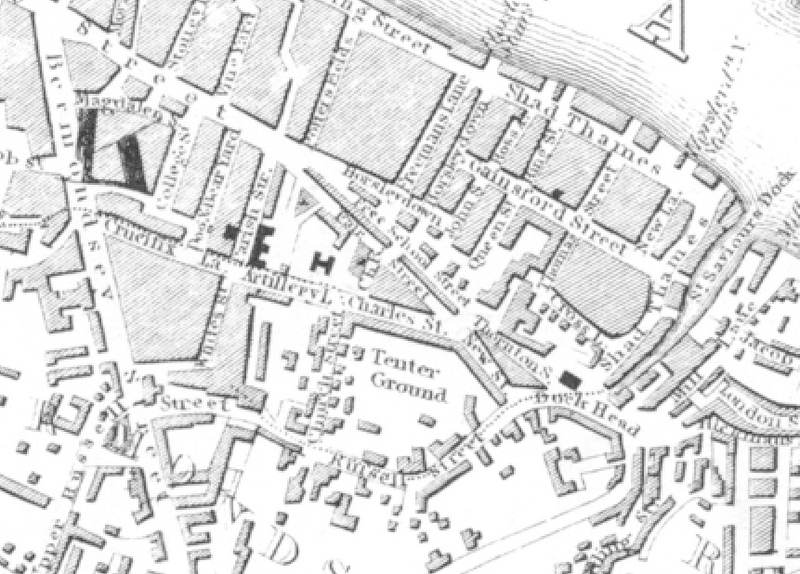 By the end of the 18th century, Russell Street had joined up with Bermondsey Street and the map from 1832 indicates that there was still considerable area open ground to the south. 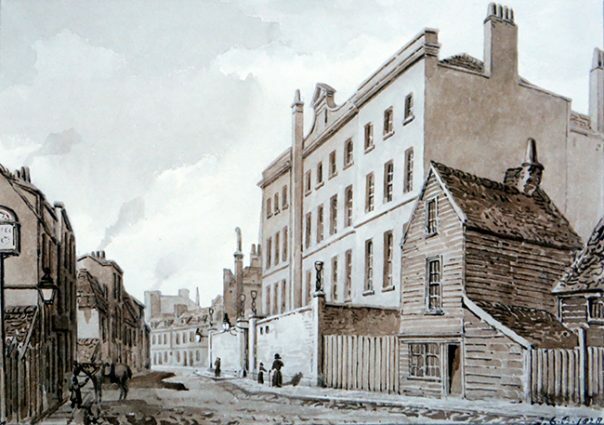 A large area to the north of Russell Street was laid out as a Tenter Ground and used for drying newly manufactured cloth after fulling where wet cloth was hooked onto frames called tenters and stretched taut so that the cloth would dry flat and square. 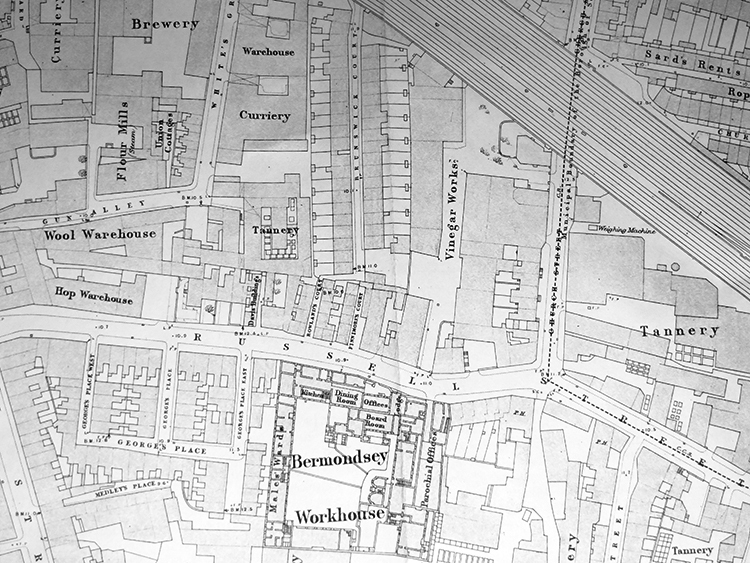 A later OS Map of 1874 shows wool and hop warehouses, tanneries and currieries marked everywhere. It was estimated that by the end of the 18th century, a third of all leather was manufactured in Bermondsey. 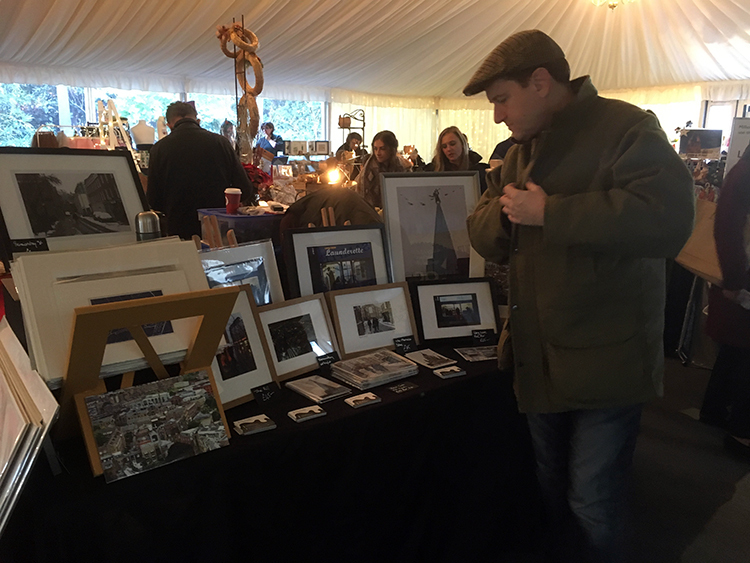 Many leather dressers were drawn to the area and Bermondsey was know as “The Land of Leather”. The Vinegar works (later know as Sarson’s) can be seen for the first time, and the expanded railway from Greenwich, Croydon etc, makes it’s way into London Bridge Station. This map also provides evidence of housing on Russell Street and east of the Workhouse, lies George’s Place totalling 54 dwellings crammed into a tiny area. 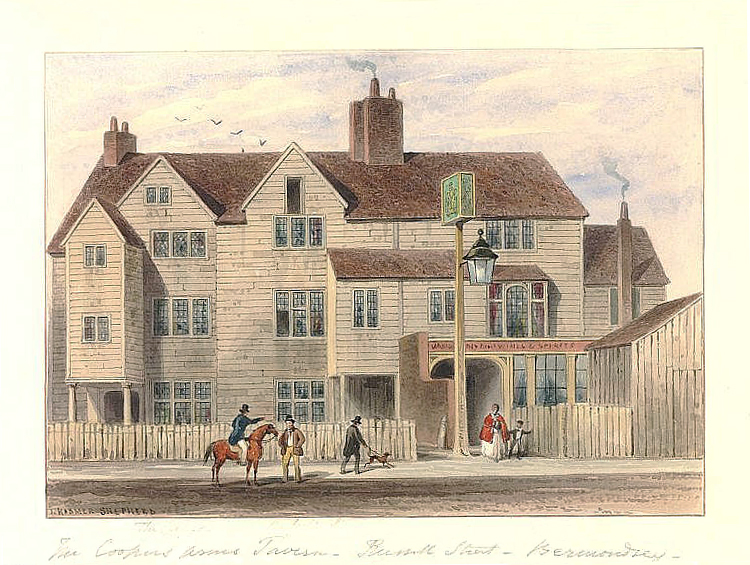 Bermondsey was not short of pubs, inns and taverns and the Cooper’s Arms Tavern was located on the site of modern day Tanner House. Rowlands Court and Finimore’s Court, located next door accounted for a further 16 dwellings and backed onto Brunswick Court. 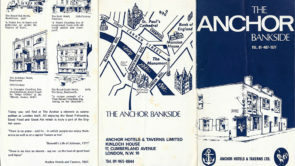 Other public house included the Blue Anchor at 61 Russell Street, the Raven and Sun at 27 Russell Street and the Stingo Arms at 86 Russell Street. It is easy to forget that Tower Bridge Road was not yet built and the route of Russell Street continued unbroken to Dockhead. Much of this section of the road has also been developed for tanning and leather making. 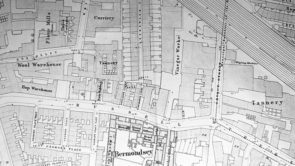 By the end of the 19th Century, the area will have been thick with the smells of industry and Bermondsey was ready to rebrand the roads in and around Bermondsey Street with new names. Russell Street was soon to become Tanner Street.